This year I'm experimenting with getting more seed potatoes from a bag of tubers by cutting in half a couple of tubers of each variety that I'm growing (Home Guard, Charlotte and Cara). I'm aiming to get decent sprouts on each half and will let the wound heal and then plant out as normal. I'll mark the row and see how they do compared to the tubers I'm planting whole. I'm interested to see if any rot while healing and whether you get a larger or smaller yield or bigger tubers or just more but smaller ones. 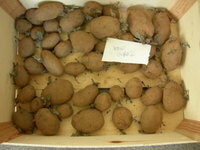 I'm also holding back a few Charlotte tubers to plant in August, hoping for a crop of new potatoes on December 25th. But I'll make sure I've buried some from the summer harvest in a sealed bag filled with sand just to make sure I have this Christmas treat whatever happens to the late sown crop. It's a compilation and it was all cut on one day but it's still a record of what was growing in the garden last week. And it keeps us looking daily to see what's new. 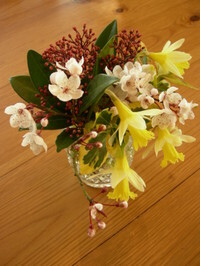 The skimmia (rear) and the miniature daffs (front) are repeat guests but the flowering plum (centre) is new. It seems incredibly early but the weather has been mild. This week it looks as if it'll be daffs, daffs and more daffs but I've been eyeing up some richly coloured cornus stems for contrast. These appeared in the lawn at the start of the week - a sure sign that the mowing season will get under way shortly. I decided to dig some out and bring them inside and they were an amusement for several days. 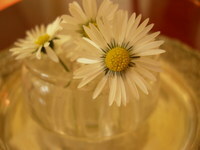 I don't mind them in a lawn, along with buttercups and the odd dandelion. In fact I do like them in a lawn as they add colour. - They all get knocked back anyway when you mow. Sure, a manicured, weed free, sward can look great but I'm not putting in the work that involves. Our own lawn will gradually shrink as more of it is set to shrubs, ground cover or turned over to growing vegetables. The yellow riff this week started on Monday last when I noticed the grellos (turnip tops/turnip greens)I'd sown in August were flowering and setting seed. 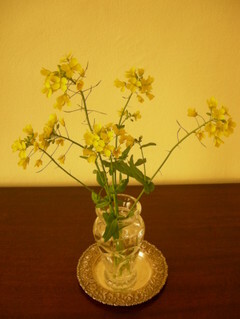 I cut a spray for the vase - taking vegetables in the flower garden a step further. By the end of the week the pigeons were fast demolishing the crop and everything else unprotected but I wasn't too bothered as it left less to clear up. I didn't miss the crop as it was too bitter. 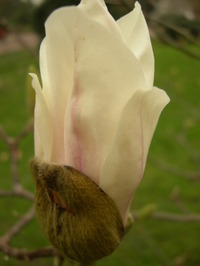 I think I'll try sowing it later this year - mid September maybe. And if it's still not as tasty as my kales then it's not getting a third chance. 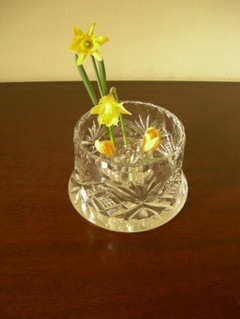 The dwarf narcissus and the crocus, below, were trampled by the dog on one of his early morning 'mads' in the garden, racing out the door with a banshee howl that's sure to grate on the neighbours. So I didn't mind cutting these to bring indoors. Why he expends so much energy for such little purpose at such an early hour is beyond me. Even after two coffees I'm still silent and just working up to some semblance of thought. It's the earliest I've done it but the window sills have been taken over by seed trays. Even though it's winter, seed sowing has started - indoors at least. I've sown up a second set of Norli and Taiwan Sugar Peas in lengths of plastic guttering. The first lot were sown impossibly early but went into to the ground about a week ago and so far have withstood the weather. I've several sweet pea on the go - some in an unheated greenhouse, the rest indoors to see how they do. All the seed is saved from last year - a mixed blue, white and pink collection, some all white and some 'chocolate'. This year the tomato choice is Mortgage Lifter, Copia and Black Cherry along with lots of San Marzano. I've sown these now and I'll compare results with a later sowing in March/April. About that time I'll also sow Golden Sweet, that sweet, sweet cherry tomato, the suplus of which I'm still enjoying as pasata. Chilli peppers- Ring o' Fire have been sown. If it fails then I've time to bring on another lot of plants. The Charlotte, second early potatoes, are chitting nicely and I've followed these with some Home Guard, a 1942 introduction and an early potato which Alan Romans rates as "an early early which is best eaten early." As I'm only sowing a few tubers for 'new potato meals' that seems fine. I've also set out some Cara, late maincrop, which Romans says is the "red eyed tough guy for the garden and allotment." So it bodes well. And I may also get my hands on some Sarpo Axona. I tried the Sarpo Mira previously and it was blight resistant with a good yield. If it stays dry and we get some sun next weekend I'll try and get out on the allotment to plant the shallot and onion sets and check on how the garlic is doing. If not I'll sow some celeriac for planting out in April/May and see if I can get a crop this year. 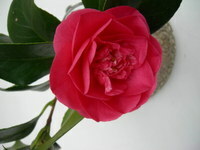 This time it's another Camillia brightening up the winter table, a pink one blooming on a north east aspect. 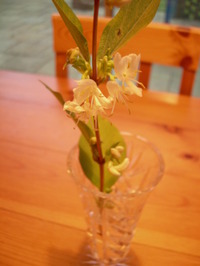 The Lonicera, below right, doesn't show as well with its leaves splayed back and flowers held forward. But its sweet fragrance gives it the common name Wintersweet. 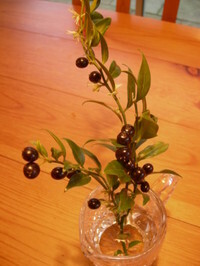 I was taken by the striking black berries on this Sarcocca, left, also known as Sweet Box but it didn't last long on the table - the cloying sweetness of its creamy white flowers was too much.